The beginning of a $100 billion industry about to flip to LEDs with 30% growth in the C&I LED lighting market. The transformation of our lighting technology has been predicted for more than a decade. It's now occurring with the Edison bulb giving way to the LED. And it's starting in the commercial and industrial sector first. 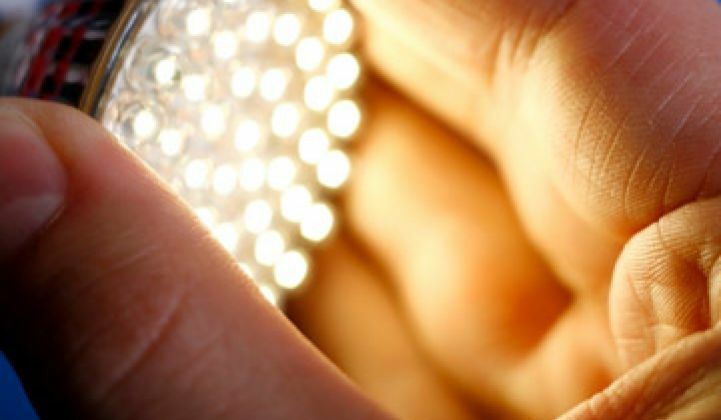 Groom Energy and Greentech Media Research predict that the LED enterprise lighting market will grow next year by 30 percent and surpass $1 billion in annual revenue by 2014. In a document released today entitled Enterprise LED Lighting Research Report, the 2010 U.S. market for commercial and industrial LED lighting is sized at $330 million in annual revenue. The report provides a guide to the market with a review of the the top 50 LED lighting manufacturers, and identifies and analyzes the top four enterprise LED market leaders including Cree, Philips, Lighting Science Group and BetaLED. The complex engineering challenges behind LED lighting (compared to incandescents) have created opportunities for startups, and venture capital funding has flowed by the hundreds of millions into this sector. The incumbent sales channel controlled by the likes of Sylvania, Osram and Philips presents a challenge to newcomers and requires a new channel approach or aggressive partnering with these existing vendors. Venture investors like Alan Salzman of VantagePoint Venture Partners see this transformation occurring in lighting, with everything switching to solid-state technology and causing "a $100 billion industry to flip" in the process. In Salzman's view, the mammoth lighting incumbents like Philips, GE and Osram "might catch up -- or might not." 3. Increased interest from building owners in applying sustainably oriented lighting retrofits that save money for their operations. "We're seeing a whole range of well-engineered new products that produce high quality light and provide strong financial returns based on their energy savings," said Fritz Troller, one of the authors of the report and vice president of marketing for Groom Energy. "It's a perfect combination to produce accelerated LED market adoption." "This is the first study we've seen specifically targeting the commercial and industrial market and its observations are consistent with our own view of the high growth rate we expect in the next few years," said Mark McClear, director of business development at Cree. More information on the LED lighting in the enterprise report here.